Let’s take stock for a moment, as indeed we should. Seventy-one years ago, Mahatma Gandhi was murdered by Naturam Godse, a member of the RSS. Godse thought that Gandhi was too soft to the Muslim population especially as regards Partition. 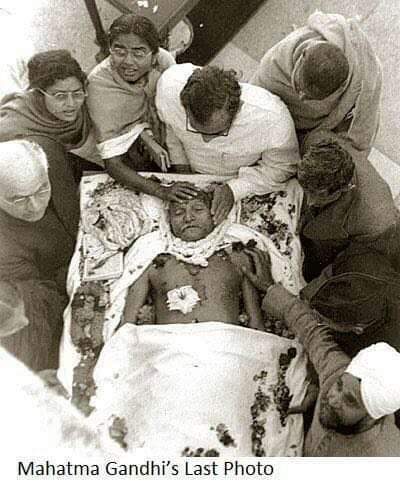 With three bullets, Godse mowed down one of the greatest people in modern history, more responsible than any other individual for the freedom of the 330M people of India. That India has been ravaged by the British; India went from about 24% of the world economy in 1757 to just over 4% in 1947. Still despite beggary-by-robbery, induced-famines, endemic disease, illiteracy, and other ills, Indians could dream. People like Gandhi and Nehru conceived of a great society, rising from the ashes of the British arson. Though they had very different conceptions of how that society would be organized, they together were able to see through the fog. Both Gandhi and Nehru thought not only of the welfare of the Indian people-and their progress- but also of worldwide moral leadership. Their ideas spawned greatness elsewhere- Gandhi found an acolyte in the inestimable Martin Luther King Jr. and Nehru an inspired follower in the eternal freedom fighter Nelson Mandela. Such was the timber of these two remarkable figures. Such was their ability to dream and to act on those dreams. In today’s technology-saturated, positivist society, abstract concepts like moral leadership have no truck. Strong men’s bluster, money, and social-media popularity are the currencies of the day. Those Indians under the age of 30 can very understandably claim no particular connection to the Freedom struggle or even to Nehru, who lasted 17 years after Independence. Gandhi was of course mowed down just as his life’s work had come to fruition though not in the fashion that he wanted. 71 years ago. Yes, the youth of India has its own concerns and can even fairly ask for us to stop shoving the past down their throats; after all, they have to live in the present and build a life for the future. But- irony of irony- this very past has everything to do with their present and future. So, therefore, we must never cease to emphasize it. If we can reanimate the metaphors of the past, we can dream again- not of cell phones and stock quotes but of decency, humanity, intellectual ferment, health, science, and sustainability. If we can reanimate the metaphors of the past, we can usher in a future that lives true to the creed of sacrifice, service, happiness, and morality. The Indian Freedom Struggle was one of the most momentous processes in modern history. The British found a wealthy country and proceeded over two centuries to denude it of resources and even of life itself. Though it is fashionable to think of the British as benevolent imperialists (as compared to other imperialists), that conception is ahistorical. The body count will in the final reckoning run into the hundreds of millions, a feat not even Hitler could manage. The Freedom Struggle was therefore about the lives of hundreds of millions of Indians. It was about a dream not only of Independence but on the ability of Indians to self-determine and to exist, to live, to love, to eat, to work as they wanted. Though on balance we have failed hundreds of millions of our fellow citizens in Independent India, this does not change the immensity of the Freedom Struggle. Scores of millions of Indians were involved in the struggle, thousands were jailed, and thousands were murdered. No doubt, historical forces are not reducible to the acts of one or two people. But of these millions, Gandhi and Nehru stood out not only because they assumed roles of Power but because of their ability to dream. They could conceive not only of an India defined by the negative (No British) but by the positive (A Great Society.) In today’s India, in which elections are fought and power is concentrated through the power of negation (against Muslims, against Farmers, against Dalits), positive dreams of a humane society would do us all good. Indeed we can but we must immediately take steps to make it possible to do so. There are no shortcuts. The first step is doing away with the largest of all travesties- the glorification of Godse and his ilk. To glorify Gandhi’s murderer is to murder the dream of India. We can understand the diminishment in emotional tenor as regards the Indian youth’s relationship to Gandhi –given how long he’s been gone- but it is beyond the pale to glorify his assassin and the creed that conjured such violence. The second step is the put an end to the redaction of history that is part and parcel of the Sangh’s conception of India (an India of negation.) Not only must we stop celebrating the evil perpetrated by the Sangh, we must reclaim history and fill-in the omissions. The third step is to re-engage with history so as to imagine what India could indeed be. Should we not take the best of our historical accomplishments and inclinations as the bedrock of a modern, progressive society? We must engage in all of these steps in order to have even the remotest chance of answering this question. But, answer it we must. Gandhi and Nehru were not perfect; dreamers never are. What they ceded to us, however, was a vision of a society that benefited from tradition while embracing progress, built on the foundation of fairness, justice, and moral leadership. We’ve strayed far – as far as one could imagine- but the beauty of dreams is that we can reset the frame.